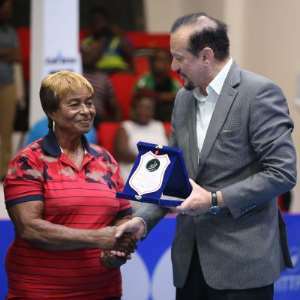 Quietly, unobtrusively, Ethel Jacks walked into the Sports Trust Emporium in Accra on Thursday 11th April, the venue of the 2019 ITTF African, Youth, Junior and Cadet Championships; not many players were sure of her name but quickly, some older coaches, recognised her, they started and exchanged pleasantries. Ethel Jacks won the women’s singles title at African Championships on three consecutive occasions; she succeeded in 1964 when like today, the host city was Accra; later in 1968, she won in Lagos before in 1974 once again being crowned the champion in Alexandria. Now 76 years old, she was welcomed by Khaled El-Salhy, the President of the African Table Tennis Federation and Mawuko Afadzinu, the President of the Ghana Table Tennis Association. A special award was made in her honour. Significantly, Ethel Jacks called for a one-minute silent for her doubles’ partner, the late Ernestina Akuetteh with whom she won gold at the African Championships in 1964 and 1968. The two further players to have won the women’s singles title at an African Championships on three occasions are Nigeria’s Bose Kaffo and Olufunke Oshonaike.